On this basis, we propose two models to forecast gold prices, a monetary-based one and a debt-based one, which can help us determine a medium-term fair value range for the gold price. The variables we use in these models are policy rates and exchange rates for the major countries, US real rates and credit spreads, as well as US debt levels for the second model. We also confirm that the behaviour of gold depends on the macro-financial environment, and that it tends to provide the best performance in risk-averse periods. of total assets, in the case of portfolios essentially invested in fixed income assets, as gold shows limited correlation with these; but in all our simulations, an even modest allocation to gold looks justified. These results should be seen as indicative, as central banks’ allocations do not respond to a standard return/volatility framework. Defining a more precise target weight for gold depends on a number of factors, including the investor’s objectives, risk appetite, current portfolio and expected returns on assets, but in all cases our optimisations lead us to recommend some allocation to gold in central bank reserves portfolios. Gold has been used as an ornament since the first ages of civilization, and as a currency since ancient Egypt and Mesopotamia. Gold, silver and bronze circulated widely in the Roman empire. Our ancestors rapidly identified its unique properties: it is a rather scarce commodity, as well as inalterable, malleable, portable, due to its small size and high density, and easy to recognise. Closer to us, the conquest of the Americas by Spain and Portugal was driven by a search for gold and precious metals, a major source of wealth for these kingdoms, before becoming a curse. The role of gold has remained central in modern times, as the development of paper currencies has been based on a gold anchor – ie, currencies being exchangeable against a certain weight of gold. Western central banks have therefore historically have held large stocks of gold. As a result of the emergence of the United States as the global superpower, the US Federal Reserve’s holdings accounted for about two-thirds of central bank reserves at the end of World War 2. The collapse of the Bretton Woods agreement in 1971, with President Nixon’s decision to end the convertibility of the US dollar into gold at a fixed rate of $35 per ounce, then led many analysts to anticipate a decreasing role for gold in a flexible exchange-rate system. After a strong advance during the inflation surge of the 1970s, gold prices actually remained fl at for the following 20 years (see graph below), leading major central banks to reduce their holdings of an asset that had lost its shine and did not offer any return potential in an environment of low inflation. As an illustration, the Banque de France sold 588 tons, or close to 20% of its gold reserves, between 2004 and 2008. 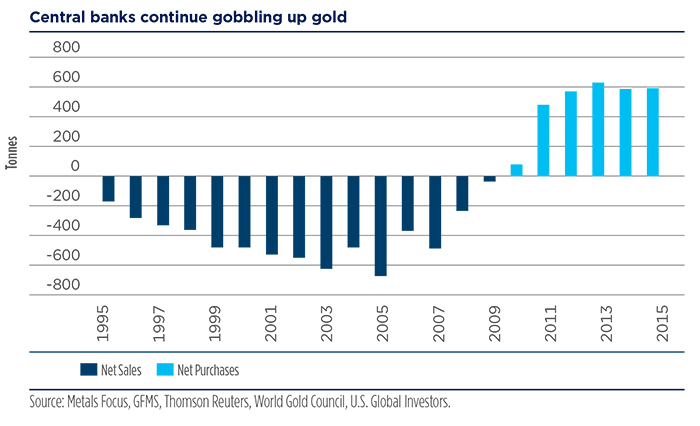 Trends nevertheless started to change with the new millennium, and gold prices have picked up significantly since 2000. Among several explanatory factors we point to the Washington Agreement on Gold which was signed in September 1999 by the ECB, the 11 national central banks of countries participating in the European currency, plus those of Sweden, Switzerland and the UK. These institutions acted in response to announcements of gold sales that unsettled the markets and announced that gold would remain an important element of global monetary reserves, and that their annual sales would not exceed 400 tons per year over the following five years. This agreement was renewed in 2004, between the same parties, with the exception of the Bank of England – which, by the way, now only holds 8.4% of its reserves in gold. The 2008 crisis marked a major change in central bank behaviour, with residual sales on the part of Western central banks more than offset by gold purchases by emerging central banks, whose reserves increased strongly due to their external surpluses linked to their rising share of global trade (in the case of China in particular) as well as rising commodity prices (in the case of Russia). This change of trend in central bank net purchases is well illustrated by the following graph. After having reached a bottom of about 30,000 tons in 2008, official gold reserves have moved back since then to about 34,000 tons. The rise in the size of reserves has not been the only factor behind gold purchases by central banks in large emerging countries. They have also been willing to diversify away from the US dollar, which still represents about two-thirds of central bank reserves. Diminishing confidence vis-à-vis the US currency is triggered by economic as well as political factors. Rising private and public debt is a source of structural US current account deficits, which may eventually translate into a dollar depreciation, continuing the trend observed since 1971, with a 2.85% average annual depreciation of the US currency against gold since then (from $35/ounce in August 1971 to the $1,282/ounce level observed as of the end of 2018). The Great Financial Crisis also showed that liquidity is a major risk for all investors, including central banks, as the threat to the global financial system at that time temporarily limited access to the US dollar, illustrating the role of gold as a safe haven, which we analyse in Section 2-2. This property led Alan Greenspan, then Chairman of the Federal Reserve, to declare that “gold is money in extremis” and “the ultimate form of payment in the world”. From a political standpoint, it is well understandable that in a multipolar world which is no longer dominated by a global superpower, emerging countries wish to reduce their dependency on one currency, which has no natural substitute, as the Chinese yuan cannot rapidly compete with the US dollar, as the growth of Chinese financial markets does not fully keep pace with its economic expansion and as the euro is still a relatively recent currency subject to certain weaknesses. This does show that gold is a natural candidate for diversification strategies for central banks away from core currencies. A rise in nationalist tendencies is another cause for some countries to reduce their dependency on the US dollar, as illustrated by President Erdogan’s statement according to which “Gold has never been an instrument of oppression”1. In the particular case of countries subject to international or US-imposed sanctions, limited or no access to the US dollar is a natural source of gold purchases. 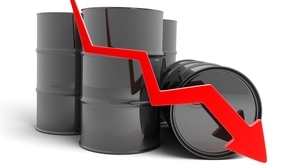 The so-called “oil for gold” mechanism which prevailed between Iran, India and Turkey allowed Iran to survive during the decade-long period of sanctions. Likewise, sales of Russian oil to China are paid for in Chinese yuan, which is then used to buy gold on the Shanghai Gold Exchange with yuan-denominated gold futures contracts – basically a barter system or trade. It is quite likely that US unilateralism under President Trump will encourage these types of transactions and lead central banks to reduce their reliance on the US dollar. It is actually worth noting that even within Europe, some countries wish to demonstrate a will to reduce dependence on the anchor currency on the continent, as has been illustrated by recent gold purchases on the part of the central banks of Poland and Hungary2, leading to a reduction in the weight of the euro in their portfolio of reserves. As a result, it should come as no surprise that the major buyers of gold since 2000 among central banks have been large emerging countries: China, Russia, India and Turkey. Starting with China, historically rather secretive about its gold reserves, it has begun reporting its monthly gold holdings after repeated encouragement from the International Monetary Fund (IMF). China claims to have 1,842.6 tons of gold in its reserves as of 1Q18, up from 1,054.1 tons three years earlier, and many believe this is still far below the nation’s actual stockpile, which is likely close to 3,500 tons. This move allows China to diversify its reserves away from the US dollar and contributes to global investor confidence in the Chinese currency. Russia’s gold reserves have also increased significantly since the crisis, from 457 tons in 2008 to a current level of 1,890.8 tons, close to the amount held by the Banque de France and now representing 18% of Russia’s total reserves. Authorities consider gold a key asset to face geopolitical uncertainties in a context of global tensions following the Crimea referendum in 2014 and the subsequent imposition of sanctions. Even though starting from a much lower base, the Turkish central bank has also been a major buyer of gold in the recent period, purchasing an average of 11 tons per month from May 2017, leading to a doubling of gold holdings in just one year. In fact, Turkey started as early as in 2011 to implement a policy known as the Reserve Option Mechanism which encourages greater use of gold within the financial system. During a speech at the Global Entrepreneurship Congress in Istanbul in April 2018, President Erdogan declared, “Why do we make all loans in dollars? Let’s use another currency, I suggest that the loans should be based on gold”. With 560.3 tons of gold in its reserves as at the beginning of 2018, the Indian central bank is one of the major holders of gold within emerging countries, even though amounts held have been stable since 2009, following a big jump that occurred that year. Holding gold in its reserves is important as this is seen as a way to inspire confidence within the population due to the solidity of its institutions. Gold does indeed lie at the heart of India’s culture: it is an integral part of religious ceremonies, an important family heirloom, and a common gift for grooms and brides. It is also considered by the population as the safest investment, a protection against bad times, and Indians invest personally in gold. A recent newspaper article3 stated that, “The most tried and tested way to survive the market instability is through gold-based investing”. A less significant but worth-noticing factor behind the rise of gold in central banks’ reserves is linked to the fact that in certain gold-producing countries, the central bank is committed to buying a set proportion of domestic output at a preset price. The case of Kazakhstan is particularly striking in this respect, with gold reserves having increased by 453% between 1Q00 and 1Q18, to reach a level of 310 tons, and absorbing a significant share of domestic gold production. 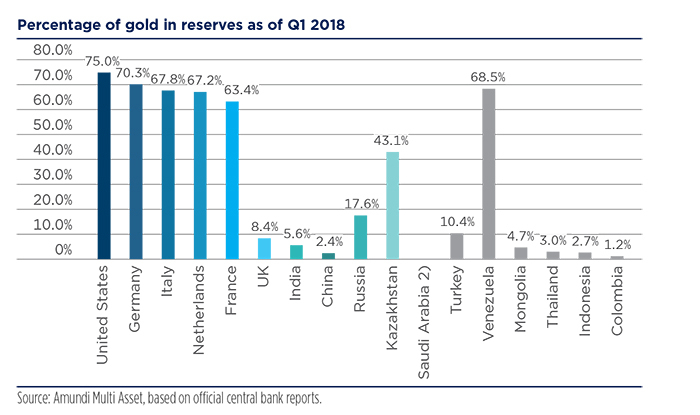 As a result, gold now represents 43.1% of total reserves for the National Bank of Kazakhstan, a very high proportion within the universe of emerging central banks, admittedly also resulting from the sale of part of its reserve in US dollars which took place in 2015-16, when the central bank had to defend the Kazakh tenge, affected by the crisis in Russia. Despite the trends observed over the past 10 years, gold generally represents a modest percentage of total reserves for large emerging countries with the exception of Russia and Turkey, and a far lower one than for the most developed countries, such as the United States, Germany, France or Italy, for which gold is the main asset in central bank reserves. With such a wide distribution, average figures have limited meaning, but the World Gold Council estimates that gold typically represents an average 12.7% of central bank total reserves, a figure admittedly biased to the upside by the historical position of the major developed central banks. Is this just the result of history or can we find a justification for such weight from a financial point of view? We investigate this question in the following section. The first link we focus on, and here we are at the intersection between financial and political considerations, is the one between gold and the US dollar. High gold prices are typically associated with a weak dollar environments, and this is well understandable, as the price of gold is a sort of barometer for the global financial system, whose main reserve currency is by far the US dollar. As a result, periods of growing distrust vis-à-vis the US currency linked either to US domestic problems – for instance, when a US recession is anticipated or if threats to global financial stability are seen – are favourable to gold. The Great Financial Crisis was probably been unusual in this respect: in the midst of the Lehman crisis in October 2008, gold prices weakened in anticipation of a global recession while the US dollar appreciated – admittedly from an historical low – as access to liquidity in the major global currency became diffcult, contributing to a rise in its value, before a parallel and atypical strengthening of the dollar and of gold prices at the beginning of 2009. It can be misleadingto look at gold prices in US dollars. One explanation behind the traditional pattern of a negative correlation between the dollar and gold is that in times when the dollar is losing value, investors might want to look for other assets via which to diversify their portfolios. Several academic papers4 have found gold to be a useful dollar hedge using data related to a number of currency pairs. It can therefore be misleading to look at gold prices in US dollar terms, as currency trends vs the US dollar have to be taken into account in the case of non-US-dollar-based investors. 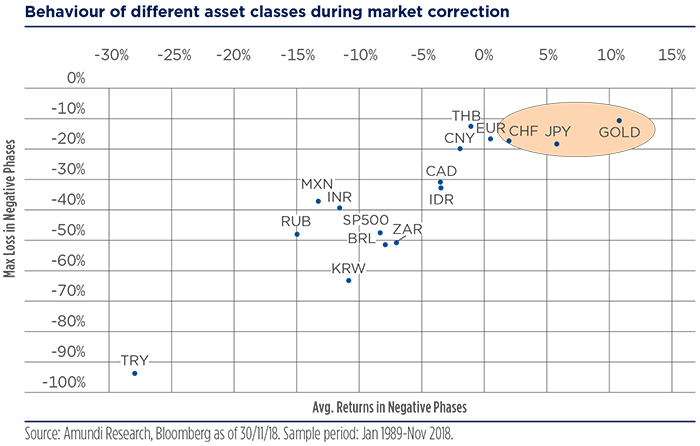 As an illustration, applying a sensitivity analysis to global macroeconomic or financial factors, we can confirm that some currencies, mainly the CHF and the JPY, show a positive response to rising stress scenarios, unlike the US dollar, which means that yen- or Swiss franc-based investors benefit from a natural diversification effect from holding gold. Such a diversification property has also been observed in the case of emerging currencies. As an illustration, showed that the gold price in Turkish lira5 was rather inelastic with respect to the external value of the Turkish currency, underlining gold’s property as a long-term hedge for Turkish investors. We have conducted a similar analysis for the central bank of an Asian emerging country and likewise showed that there is a negative correlation between gold prices expressed in US dollars and trends in the local currency against the US dollar. When the US dollar price of gold weakens, the emerging country typically benefits from an appreciation of the US dollar against its domestic currency. A number of studies have underlined gold’s safe-haven role in that it tends to be negatively or uncorrelated with other assets in investor portfolios in times of falling markets. As illustrated below, a strategy consisting in being long gold would systematically have paid off during extreme market events ranging from Black Monday to the Lehman or the Euro sovereign debt crisis in terms of a significant reduction in a portfolio’s maximum drawdown. Nevertheless, it seems that this property holds for equity, but not for fixed-income portfolios. Moreover, some studies6 have shown that such a safe-haven role tends to be observed for a limited period of time after a market crash (only 15 days, according to this study), thereby reducing its attraction from this perspective for long-term investors that would not pay attention to daily or weekly changes in the value of their portfolios. Other analysts have stressed that gold’s safe-haven property was mainly linked to its official role and the fact that central banks use it specifically to uphold confidence. As gold is increasingly used for speculative purposes, following in particular the developments of ETFs, such a benefit has probably declined. Investors then have to look for more powerful arguments to support gold’s property as a hedge. This can be the case in particular for investors wanting to protect their portfolio against adverse scenarios, in particular in terms of inflation. We have seen that political factors lie behind gold purchases by major emerging centralbanks, but gold also has a number of attractive properties as an asset class. One of the most widely accepted properties of gold is its capacity to hedge against inflation. Even though gold has indeed outperformed inflation since 1971, and spikes in gold prices were observed during the inflationary episodes of 1973-74 and of 1980, while trends in the 2000s have provided a counter-example, as the rise in gold prices which occurred had taken place during a disinflationary environment. Academic studies are actually not fully conclusive in this respect. Regarding the causes of the relationship, it has been argued7 that gold is like a currency whose value cannot be diminished by sudden large increases in its supply, as is the case for fi at currencies. In situations of higher inflation, and assuming investors are rational, they will require an increase in the expected rate of return of holding gold in order to compensate for the increased opportunity cost. Inflation can also be seen as directly affecting gold prices through a substitution effect, as expectations of increases in future prices encourage individuals to convert their assets which have a fixed nominal return into gold8. An alternative explanation has been offered9, based on the fact that gold prices will need to follow gold extraction costs to the upside, as these tend to follow general prices over the long term. Academic papers have also looked at the division between long- and short-term equilibrium relationships, as well as at the differences between US and global inflation in their relationship with gold prices. Results seem to confirm that gold is appropriate as a long-term hedge, but that the time it takes to return to equilibrium can be quite long10, and that gold does not seem to be a good inflation hedge outside the US. In the case of emerging countries, we showed11 that investors in countries subject to episodes of higher inflation and currency depreciation are advised to protect their portfolios through exposure to core currencies and in particular exposure to US, Euro or Japanese bonds, which should be viewed as natural hedges for these investors. 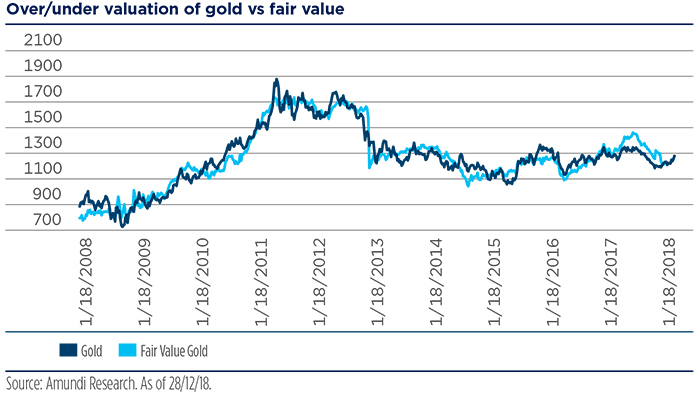 We have also investigated the relationship between inflation volatility and real gold prices, observing a significant correlation between the volatility of five-year average inflation and real gold prices. Expressed in economic terms, inflation volatility – ie, price stability – is a major driver of real gold prices, reflecting the fact that high-inflation as well as very-low-inflation periods are favourable for gold. Therefore, inflation volatility, rather than the inflation trend, best explains gold prices. Another well-researched area deals with the relationship between gold price and interest rates. As interest rates represent an opportunity cost for holding gold, a rise ininterest rates is expected to be negative for gold, an asset that does not provide any cash flow. Once again, not all research articles are in agreement and some12 argue that it is inflation which is the main driver of gold prices: an increase in expected inflation will lead to higher nominal interest rates, and this pick-up in yield will have to be matched by gold price appreciation. As a result, the relationship has to be investigated with real rather than nominal interest rates. A very strong negative correlation has been observed between the real price of gold and US real interest rates13 (the correlation estimate is smaller, although still negative, with UK real interest rates). Some studies14 have also emphasised the different behaviours vs short- and long-term interest rates, with a clear negative relationship between gold and short-term rates. This can be explained by the increased opportunity cost for investors, whereas the result is more open to debate regarding long-term rates, whose rise can be interpreted as reflecting higher inflation expectations, with a positive impact on gold. 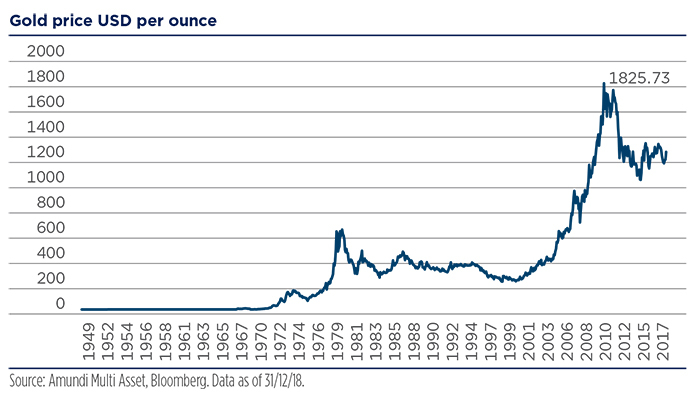 Once again, the link is not stable over time, and if the 1970s were indeed characterised by low to negative real rates and rising gold prices, and the 1980s by high real rates and falling real gold prices, low real rates over the decade did not prevent gold prices from gradually drifting downwards. 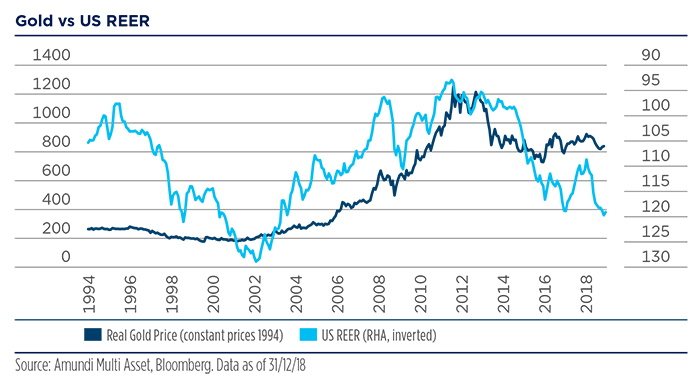 Still, our own work tends to confirm a generally negative relationship between gold and real rates, as illustrated by the graph below, and we believe that real rates need to be integrated as an explanatory variable in a gold price model. Leverage, such as US total debt. 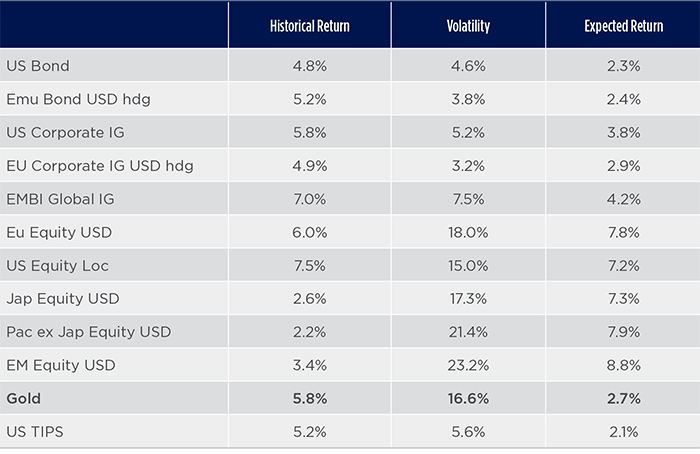 All of these factors affect market risk sentiment and gold returns. More specifically, the four factors noted above tend to move together to determine the final outcome, ie, the fair price for gold. historical fair value compared to the actual gold level. But, leverage and debt obviously matter for the gold price. In fact, countries that have a propensity for indebtedness are often tempted to increase money supply or purchase debt directly. This causes inflation and domestic currency depreciation. In such an environment, the value of domestic reserves tends to diminish and gold proves to be a good hedge. This is the main reason why the correlation between debt and gold is strongly positive. The enormous amount of debt at the global level will play a crucial role for long-term investors; investigating the relationship between gold and global debt therefore provides some useful inputs for long-term simulation. From a long-term perspective, it is quite useful to incorporate a debt dimension into the model. The fair value model based on debt dynamics provides a similar patternand conclusion vs the CB monetary-based one, confirming the strong interconnection between debt and the recent unorthodox monetary policies put in place by central banks in order to mitigate the negative consequences of the debt burdens in several countries. In this context, we leverage on the Amundi research department’s proprietary financial regime tool, the Advanced Investment Phazer (see  in the appendix for further details) in order to assess the behaviour of gold in the market regimes which are unfavourable for risky assets. 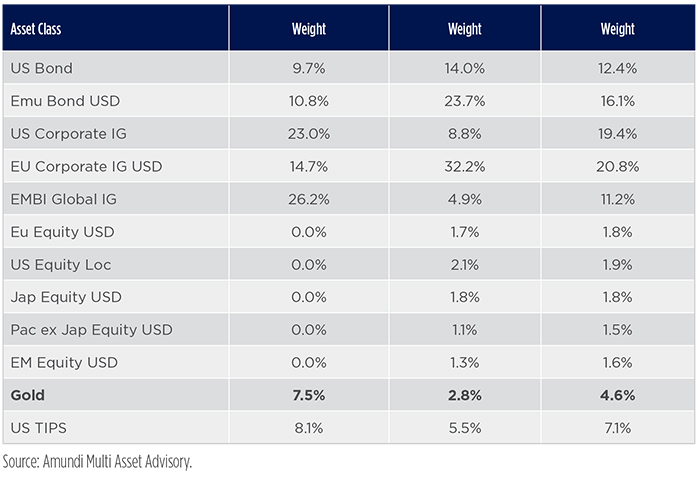 Our analysis shows that gold has provided the best performance in risk-averse periods within the universe of assets we have analysed: it delivered positive returns – around 10% on average – with limited drawdown while equities and GEM currencies recorded much worse performances. The result confirms the strong case for gold as a hedge in monetary reserves. 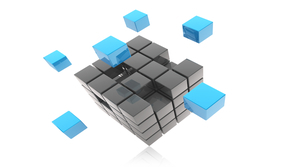 From a more technical standpoint, the optimisation scheme adopted by the investor. As far as risk is concerned, using volatility as a representative indicator can also be misleading, as central banks tend to hold gold for the long term and rarely trade their exposure to gold, implying that volatility should more appropriately be estimated over low frequencies. As gold’s presence in central banks’ portfolios is designed to reassure investors about the credibility of the national currency, especially in the context of financial crisis, it should be analysed during stress scenarios rather than in normal market environments. Using an optimisation scheme giving more importance to these circumstances will therefore lead to a higher recommended weighting to gold in a central bank portfolio, as noted above in the second section of this note. At low volatility levels, optimal portfolios are dominated by fixed-income assets, mainly German and US government, with limited exposure to equities and to gold, whereas gold dominates optimal portfolios at high volatility levels, reflecting the attractive return/risk profile of gold relative to other asset classes over this period of high inflation. Gold’s diversification potential can be observed more broadly. 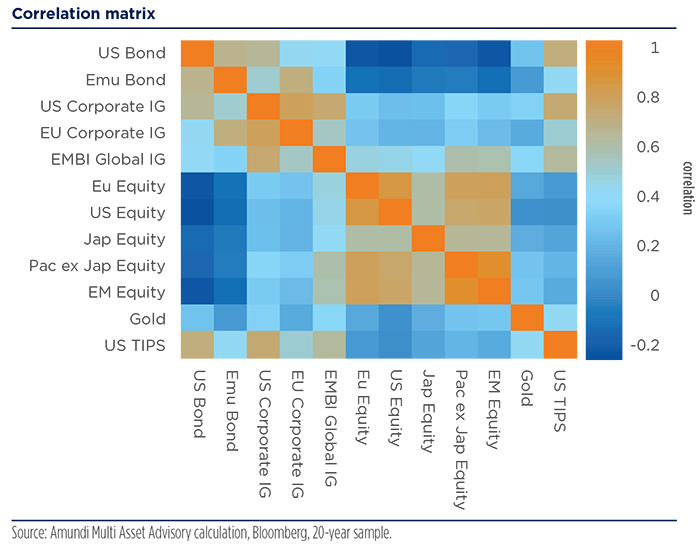 The following matrix illustrates the historical correlation between major equity, fixed-income assets and gold over the long term (historical sample on the last 20 years), with blue and light blue indicating low or negative correlations between asset classes. Gold stands out due to its absence of significant correlation with traditional asset classes, a clear attraction from a portfolio construction standpoint. Beyond the already-mentioned macroeconomic drivers, such low correlation may also be explained by a different structure of investors in gold markets compared with that of investors in traditional asset markets, even though the increased use of gold as a financial instrument facilitated by the development of ETFs probably limits the pertinence of this argument. 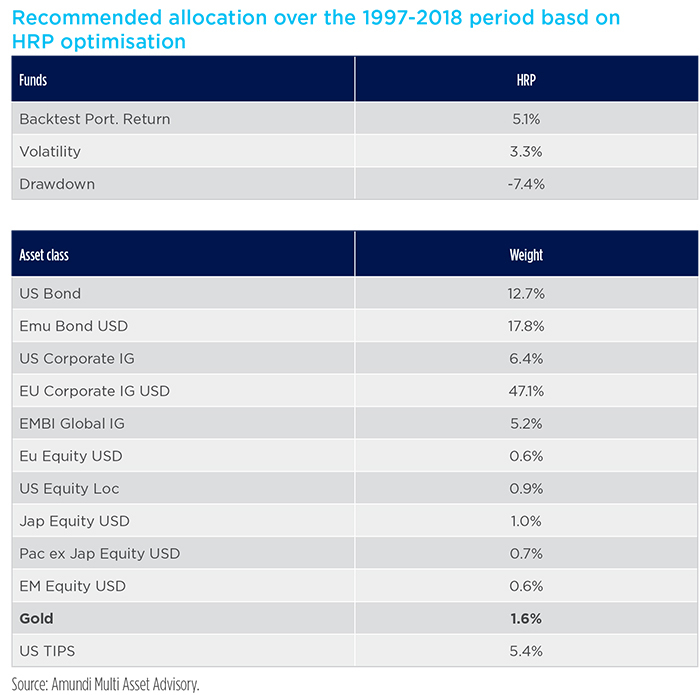 Turning to optimisation schemes, we will also demonstrate that applying portfolio construction techniques that target diversification and shortfall risk justifies holding gold for a portion of a pure fixed-income portfolio or for a cross-asset portfolio with a moderate risk profile. All these elements make gold an asset class particularly well adapted to central bank portfolios which are typically conservatively managed. Let us now turn to the presentation of actual portfolio simulations to illustrate and quantify these observations. We explored the relevance of gold as an asset class for central bank portfolios using simulations and portfolio construction techniques. The general investment universe includes different fixed income assets (including government and corporate assets) with high-grade quality (investment grade), equity assets and gold. The currency selected as numeraire is the US dollar. Assets not denominated in US dollars are hedged to the US dollar in the case of fixed income assets, while equities are considered US dollar-unhedged, in line with the most usual practice of institutional investors. As a starting point, we applied the Hierarchical Risk Parity methodology, in a context of an unconstrained investor, to derive an optimal portfolio. The concept and the technique have been developed by Marcos Lopez de Prado and do not require any estimation of expected returns or any calculation of the inverse covariance so some caveats of classical optimization problems are removed. a risk parity variance weighting scheme. In order to put the allocation exercise in the context of a central bank allocation, we need to rely on a more specific and constrained approach: for this reason, we applied portfolio optimisation with CVaR constraints. The CVaR portfolio optimisation process introduces the additional following constraint: the computed optimal portfolio weights should be such that the 99% CVaR for every simulated year is not lower than a certain amount. This approach is applied on forward-looking scenarios of asset prices over a 10-year horizon, coherent with the structure of expected returns obtained using our CASM model (our proprietary model for asset class simulation) and historical variances and covariance between assets (the same as those used for the Hierarchical Risk Parity approach). *Amundi Multi Asset Advisory Calculations. Teams, Bloomberg. Data as of the 7 February 2019. Macro figues as of last release. Interest rates updated as of 31 December 2018. Italian Curve and Equity updated as of the 18 January. Spread and FX updated as of 31 January 2019. Equity returns based on MSCI indices. One year forward views and fair values provided by Research team (macro, yields, spread and equity). Forecasts for annualised returns are based on estimates and reflect subjective judgments and assumptions. These results were achieved by means of a mathematical formula and do not reflect the effect of unforeseen economic and market factors on decision making. The forecast returns are not necessarily indicative of future performance, which could differ substantially. The expected return on gold we have assumed an expected return on gold at 2.7%, in line with our estimate of expected global infl ation. This is also consistent with the result of our fair value model, under the assumption of an unchanged debt/GDP ratio. The CVaR optimisation maximises the expected return under a 15% CVaR (expected shortfall) maximum constraint. This is calculated running Monte-Carlo simulations using Geometric Brownian Motion calibrated on the expected returns, volatilities and correlations described above. The results suggest an allocation of around 7% in gold for the portfolio excluding equity from the investment universe, while the suggested allocation in a portfolio including equity depends on the risk profile (for low to medium risk in the range of 3-5%). The low-risk allocation is comparable with the one derived using the Hierarchical Risk Parity. Those results are linked to the expectations used for gold. As the debt/GDP ratio is a relevant variable for assessing the evaluation of the decision regarding investment in gold, we used an alternative scenario stressing this variable, assuming a 22% increase in the debt/GDP ratio, in line with the increase expected by the US Congressional Budget O ce (CBO) for 2028. On this basis, the fair price for gold could increase by an average 5.5% over the next 10 years. This is a scenario that will provide support and arguments for investing in gold from a return point of view and not only based on diversification purposes. We should add that once a strategic allocation to gold has been defined, central banks are confronted with the issue of timing of their portfolio changes towards such a target. This is an issue that applies to any reallocation decision, but it is particularly acute in the case of gold, due to the high volatility of gold price. This leads to a strong impact with regard to timing, which is further intensified by the fact that central banks’ actions, and particularly gold purchases and sales, are closely watched, both domestically and internationally, and likely to draw a lot of public attention. 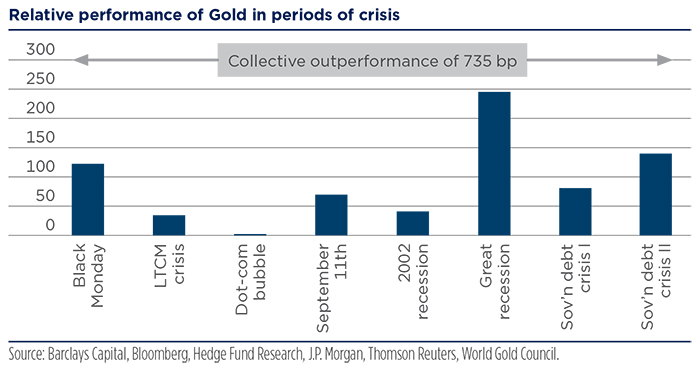 In fact, some central banks were criticised for their wrong timing in purchasing gold near the market peak in 2011-12. Moreover, there is a form of reflectivity in the sense that gold purchases on the part of a central bank will often be interpreted as the start of a trend. This therefore leads to upward price pressures and penalises the performance of the central bank’s portfolio. This leads us to recommend proceeding in gradual steps, an often-justified implementation policy, and to spread the reallocation move over long periods of time, taking advantage of calmer periods in the market to add to positions. Central banks have shifted from being net sellers to net buyers of gold since the 2008 financial crisis, reflecting the transition from a US-dominated to a multipolar world in which the importance of several key emerging countries, willing to reduce their dependence on the US currency, has increased. As an illustration, political factors have certainly contributed to the rise in the exposure to gold in the reserves portfolios of the CBs of Russia or Turkey. In addition to its role as a storage of value, gold is also useful as a hedge against potential episodes of stress and against the risk of rising inflation, as well as for its diversification potential vis-à-vis other assets. 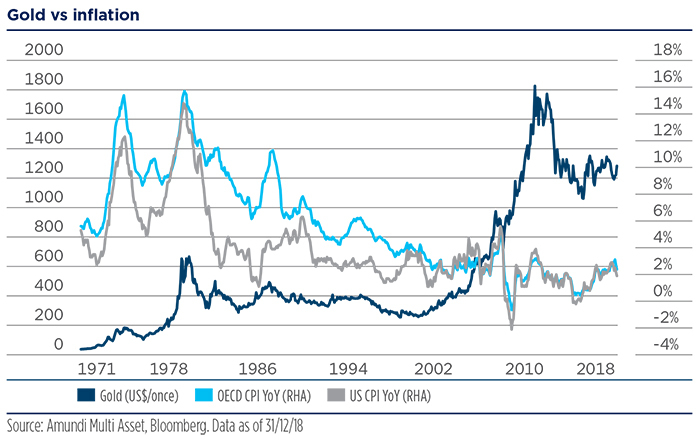 Our analysis of the relationship between gold prices and several macro-financial variables has confirmed the positive impact of rising inflation, rising financial stress and increasing debt levels, as well as the negative impact of real US interest rates. This has enabled us to construct two different econometric models, one money-based and one debt-based, helping us to forecast gold prices, and which have confirmed that gold off ers the most attractive performance during situations of high risk aversion. We then conducted portfolio simulations corresponding to different central bank situations and objectives, using standard optimisation schemes as well as a Hierarchical Risk Parity methodology, which is particularly adapted to illustrating the diversification benefits of gold. The output of our simulations depends on the structure of the CB’s portfolio and its risk aversion as well as assumptions on gold returns and on the parameters of the optimisation, but they tend to justify a portfolio weighting for gold of between 2% and 7% of total assets. The higher weighting for gold is advised for central banks which are essentially invested in fixed-income assets, and for investors looking to protect their portfolio against high inflation scenarios. What is the objective? Gold will be particularly useful if limitation of stress, high liquidity and absence of credit risk are key parameters for the central bank. What is the current portfolio structure? As already mentioned, gold tends to offer particularly attractive diversification against global bonds, justifying its presence in fixed-income-focused portfolios. 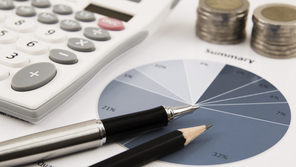 What are the expectations regarding asset returns? 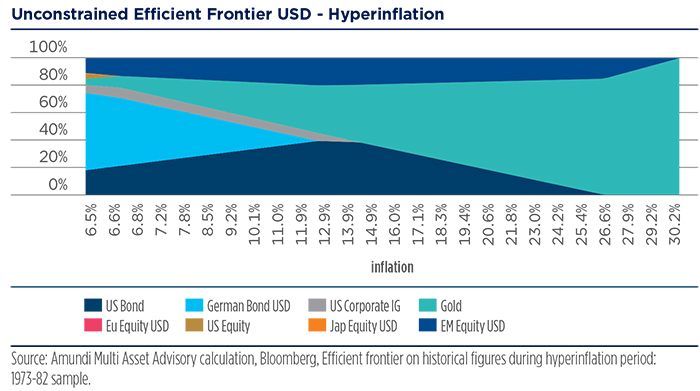 The “optimal” weight of gold will depend on what is considered to be the most likely scenario for asset markets in the next few years, especially in terms of probability of deflation or of high inflation scenarios. And, more generally, what is the investor’s view of the world? Any investor concerned about the geopolitical context and about the risk of seeing the US dollar losing its attraction as a result of the debt mountain accumulated over the past few years might well look to gold as an important component of a portfolio from a hedging perspective. 2See “The rise of central bank gold demand”, OMFIF report, January 2019. 4See, for instance, Reboredo 2013. 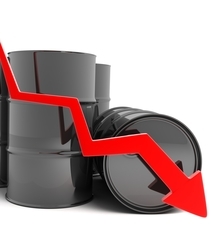 The recent context of falling oil prices affects sovereign investors in oil-producing countries in two ways: through the value of their financial portfolios and their stream of future revenues. 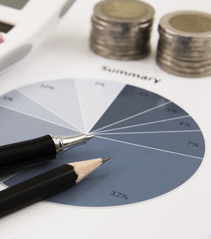 Factor Asset Allocation: What are the Benefits for Investors? Factor investing is currently very popular among investors. This investment approach was developed following the publication of a report by Ang, Goetzmann and Schaefer (2009), who were asked to evaluate the performance of active management for Norway’s sovereign fund. Euroscepticism is waning. Europe was the central focus of the French presidential election. Emmanuel Macron’s victory has laid to rest the spectre of significant destabilisation in the Eurozone.